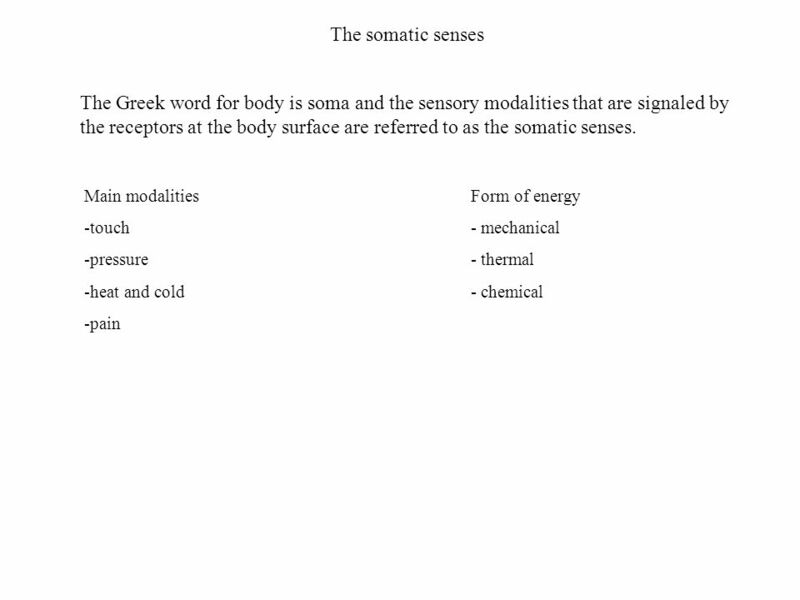 The somatic senses The Greek word for body is soma and the sensory modalities that are signaled by the receptors at the body surface are referred to as. 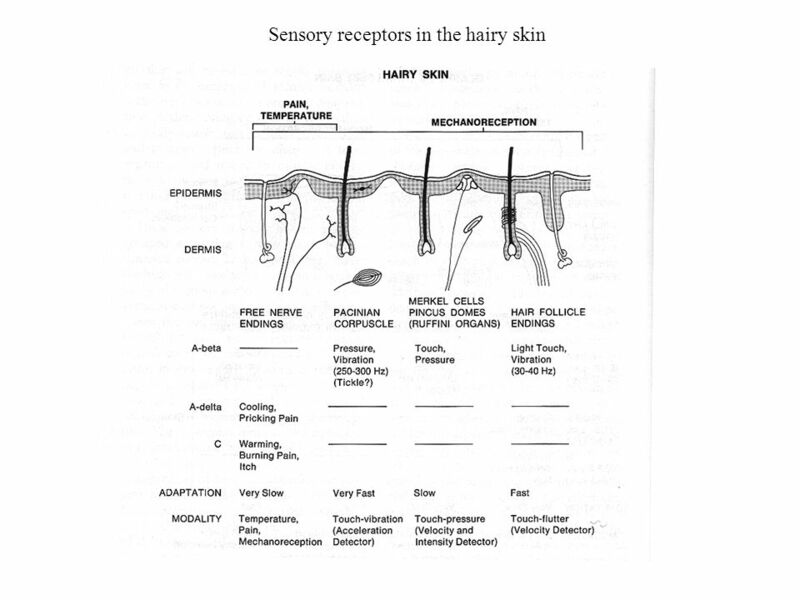 5 Free nerve endings The simplest type of sensory receptor in the skin is the free nerve ending. They respond to: mechanical stimuli (mechanoreceptors) heating and cooling (thermal receptors) noxious stimuli (nociceptors – pain receptors) Activation of receptors mediating pain. Recording of the compound action potential from a peripheral nerve in response to a single electric shock, showing different components of fast conducting (Aa, b), medium conducting (Ad) and slow conducting (C) fibers. The immediate sharp pain is mediated by Ad fibers, the subsequent constant aching is mediated by the C fibres. Skin temperature is coded by warmth and cold receptors. Static temperatures. Cooling and warming receptors are defined by the fact that they have peak sensitivities that are cooler and warmer than the body temperature. 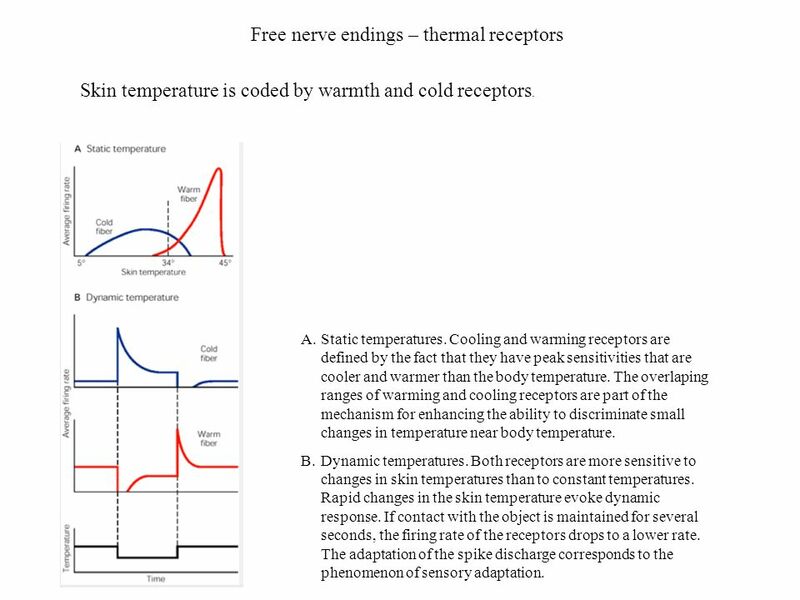 The overlaping ranges of warming and cooling receptors are part of the mechanism for enhancing the ability to discriminate small changes in temperature near body temperature. Dynamic temperatures. Both receptors are more sensitive to changes in skin temperatures than to constant temperatures. Rapid changes in the skin temperature evoke dynamic response. If contact with the object is maintained for several seconds, the firing rate of the receptors drops to a lower rate. 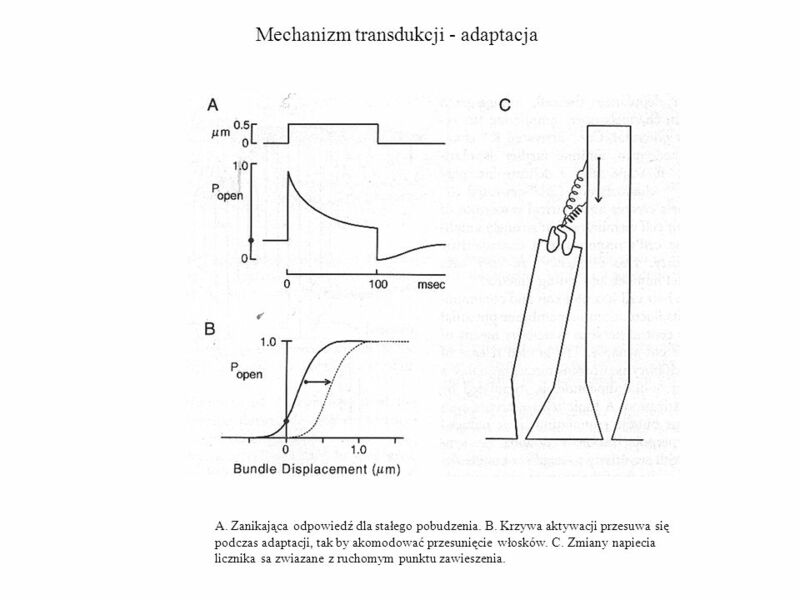 The adaptation of the spike discharge corresponds to the phenomenon of sensory adaptation. 7 Pacinian Corpuscle Pacinian corpuscle is one of the largest of the end organs. It is constructed to signal rapid changes in the touch and pressure. Sensitivity of Pacinian corpuscle and Meissner’s corpuscle to vibratory stimulation at different frequencies. 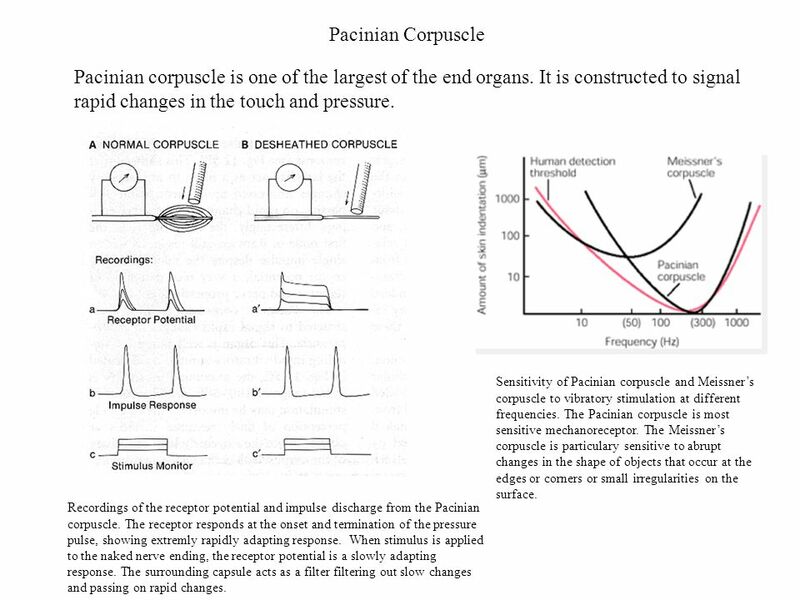 The Pacinian corpuscle is most sensitive mechanoreceptor. The Meissner’s corpuscle is particulary sensitive to abrupt changes in the shape of objects that occur at the edges or corners or small irregularities on the surface. Recordings of the receptor potential and impulse discharge from the Pacinian corpuscle. The receptor responds at the onset and termination of the pressure pulse, showing extremly rapidly adapting response. 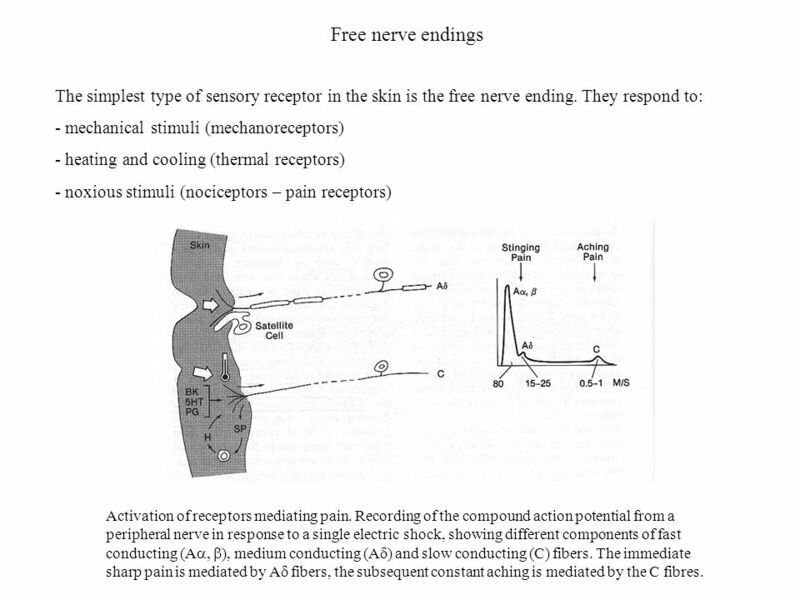 When stimulus is applied to the naked nerve ending, the receptor potential is a slowly adapting response. The surrounding capsule acts as a filter filtering out slow changes and passing on rapid changes. 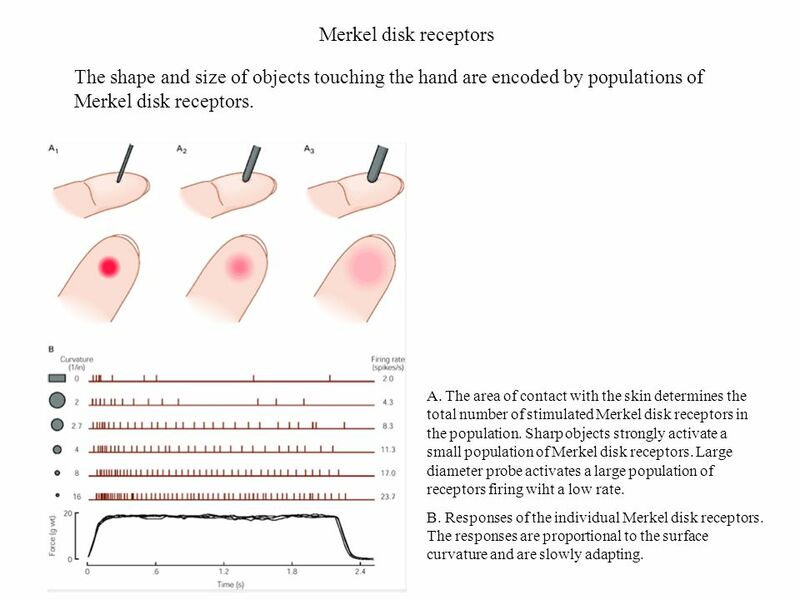 8 Merkel disk receptors The shape and size of objects touching the hand are encoded by populations of Merkel disk receptors. A. 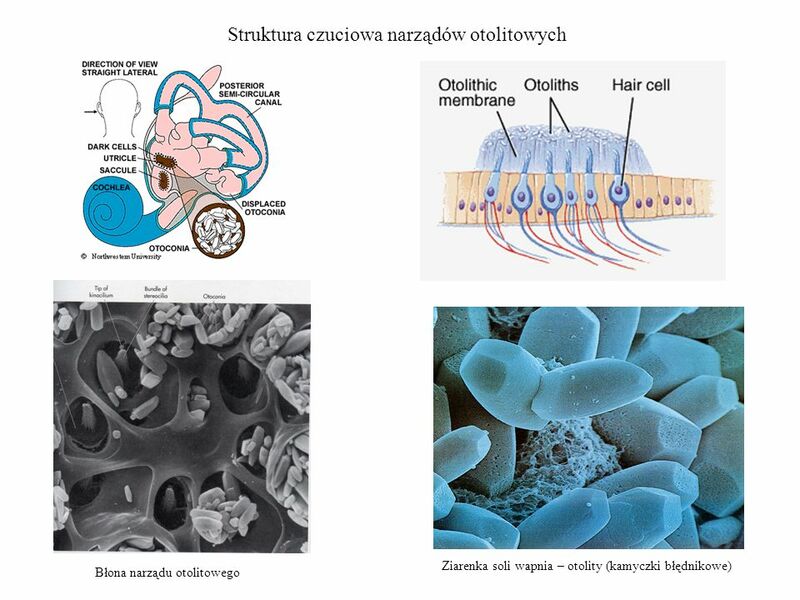 The area of contact with the skin determines the total number of stimulated Merkel disk receptors in the population. Sharp objects strongly activate a small population of Merkel disk receptors. Large diameter probe activates a large population of receptors firing wiht a low rate. B. Responses of the individual Merkel disk receptors. The responses are proportional to the surface curvature and are slowly adapting. 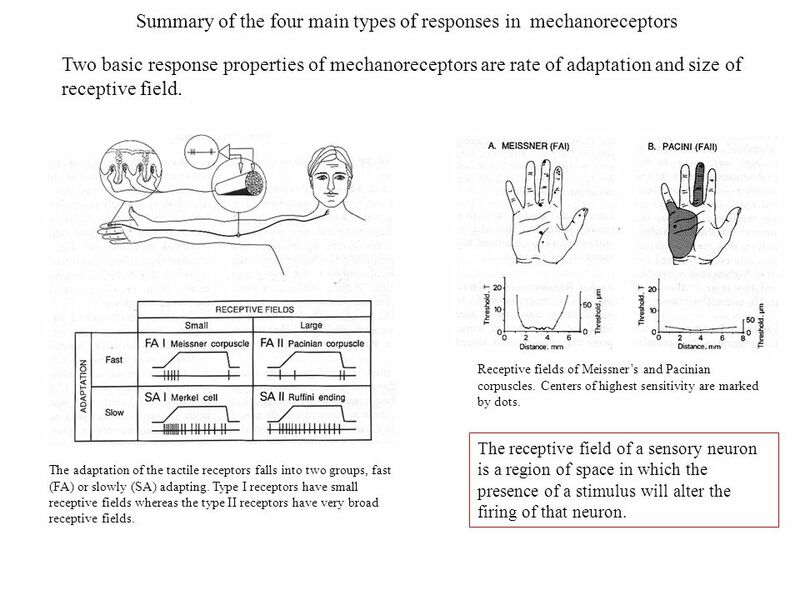 Two basic response properties of mechanoreceptors are rate of adaptation and size of receptive field. Receptive fields of Meissner’s and Pacinian corpuscles. Centers of highest sensitivity are marked by dots. The receptive field of a sensory neuron is a region of space in which the presence of a stimulus will alter the firing of that neuron. The adaptation of the tactile receptors falls into two groups, fast (FA) or slowly (SA) adapting. Type I receptors have small receptive fields whereas the type II receptors have very broad receptive fields. 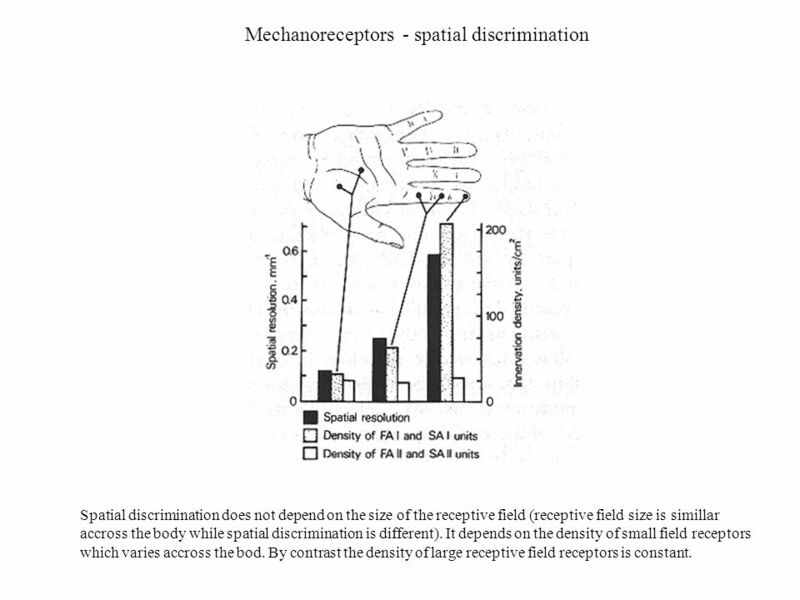 Spatial discrimination does not depend on the size of the receptive field (receptive field size is simillar accross the body while spatial discrimination is different). It depends on the density of small field receptors which varies accross the bod. By contrast the density of large receptive field receptors is constant. Two – point threshold are meausred clinically using a calibrated two-pins compass. Two – point threshold varies for different body regions; it is about 2 mm on the finger tip and 40 mm on the arm. 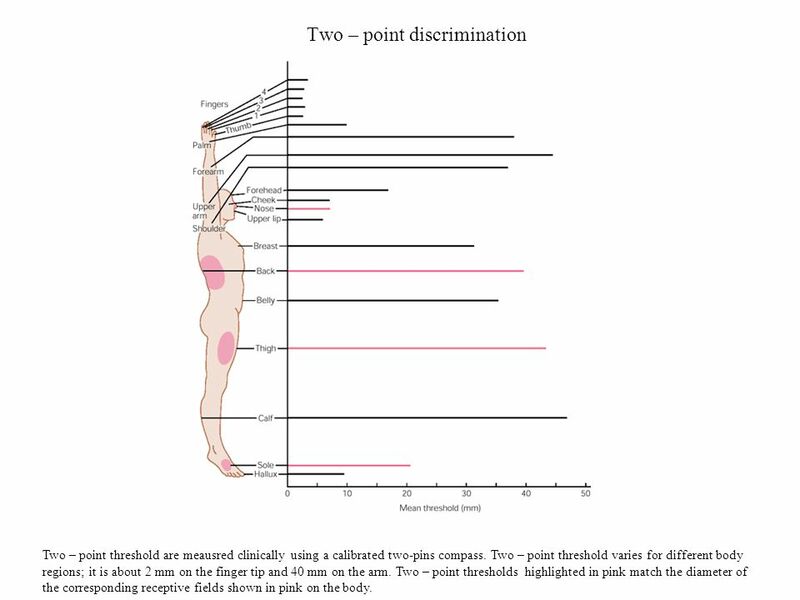 Two – point thresholds highlighted in pink match the diameter of the corresponding receptive fields shown in pink on the body. 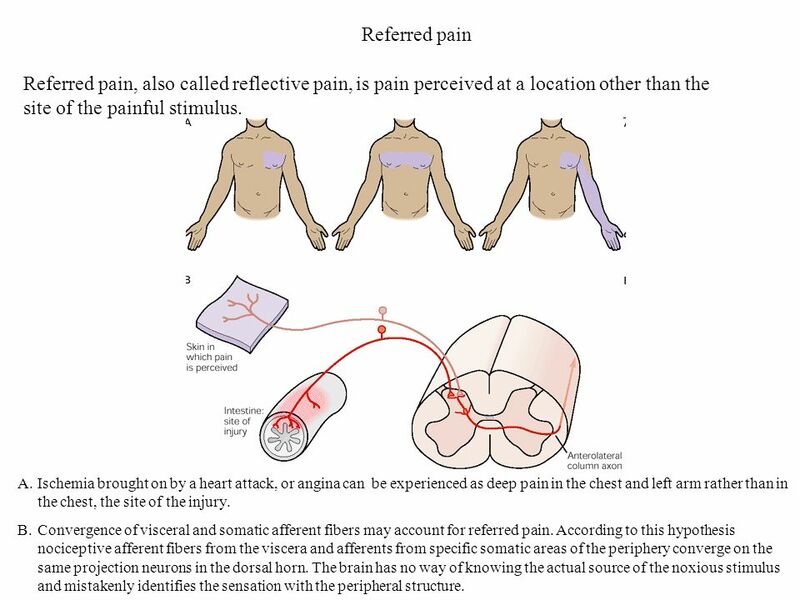 14 Referred pain Referred pain, also called reflective pain, is pain perceived at a location other than the site of the painful stimulus. Ischemia brought on by a heart attack, or angina can be experienced as deep pain in the chest and left arm rather than in the chest, the site of the injury. 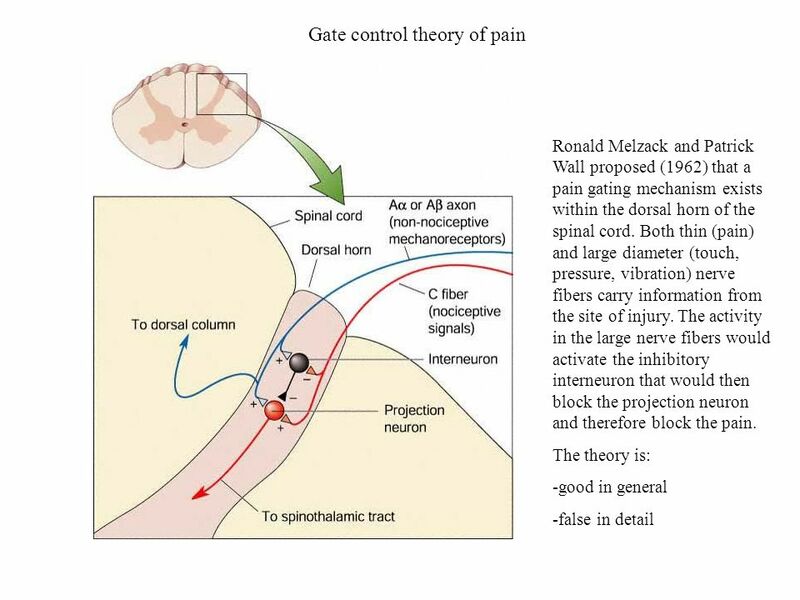 Convergence of visceral and somatic afferent fibers may account for referred pain. 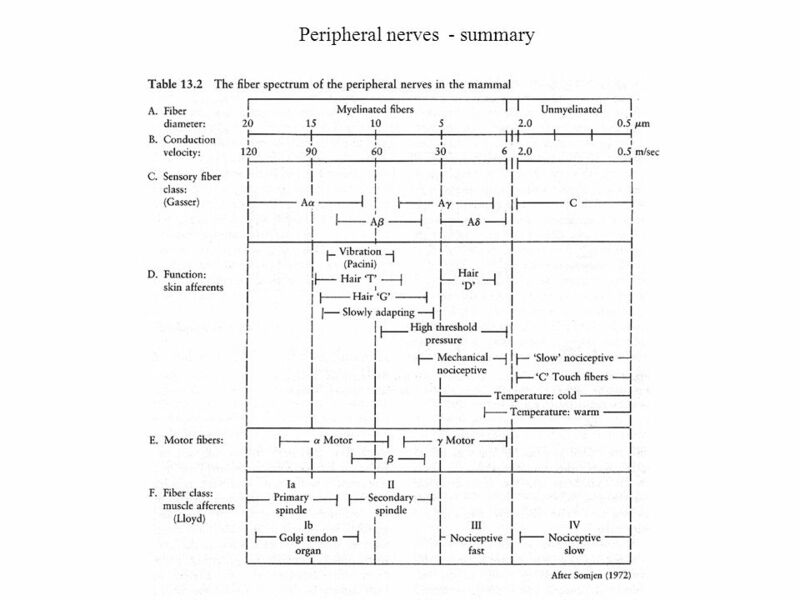 According to this hypothesis nociceptive afferent fibers from the viscera and afferents from specific somatic areas of the periphery converge on the same projection neurons in the dorsal horn. The brain has no way of knowing the actual source of the noxious stimulus and mistakenly identifies the sensation with the peripheral structure. 15 Dermatomes Spinal cord with dorsal roots. Vertebral column and spinal cord The sensory nerve fibers enter the spinal cord through the dorsal root. The area of skin innervated by a single dorsal root is called a dermatome. They can be identified in experimental animals by probing the skin with different stimuli and observing the response of the fibers within the root. The dermatomes follow a highly regular pattern on the body. 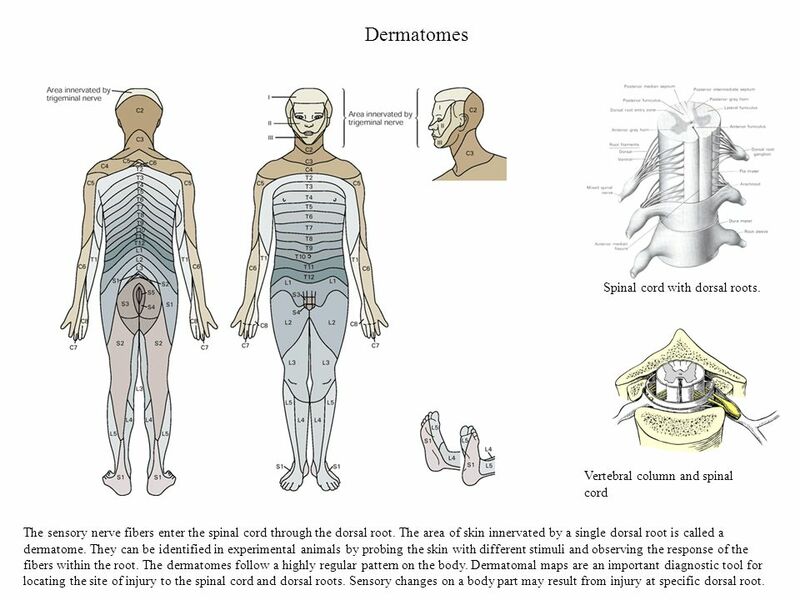 Dermatomal maps are an important diagnostic tool for locating the site of injury to the spinal cord and dorsal roots. Sensory changes on a body part may result from injury at specific dorsal root. 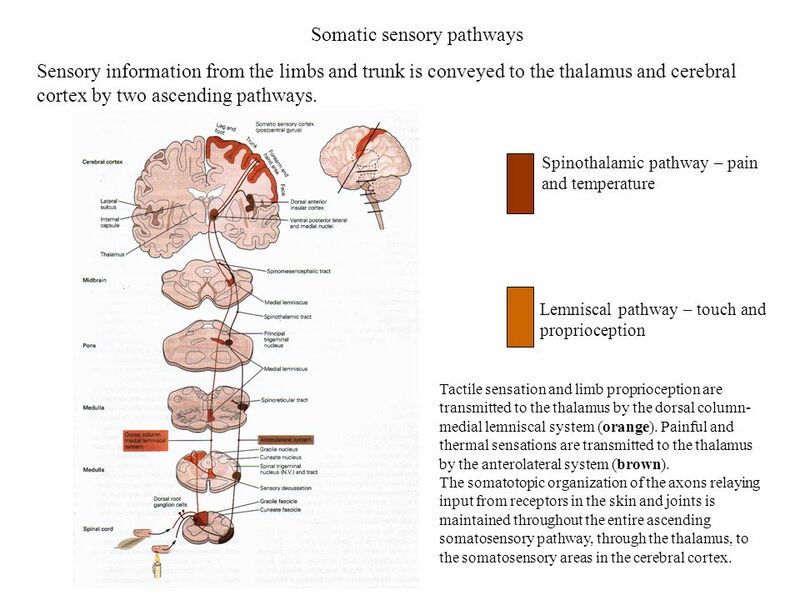 Sensory information from the limbs and trunk is conveyed to the thalamus and cerebral cortex by two ascending pathways. 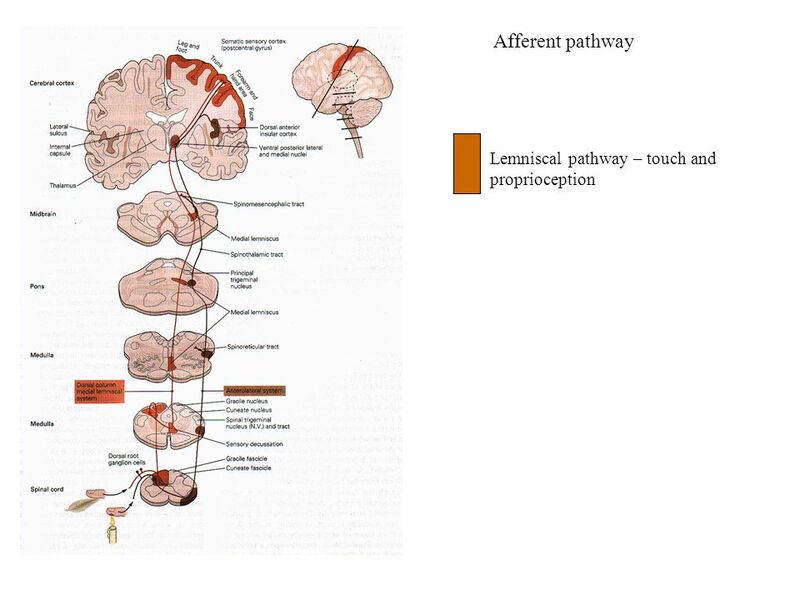 Spinothalamic pathway – pain and temperature Lemniscal pathway – touch and proprioception Tactile sensation and limb proprioception are transmitted to the thalamus by the dorsal column-medial lemniscal system (orange). Painful and thermal sensations are transmitted to the thalamus by the anterolateral system (brown). The somatotopic organization of the axons relaying input from receptors in the skin and joints is maintained throughout the entire ascending somatosensory pathway, through the thalamus, to the somatosensory areas in the cerebral cortex. 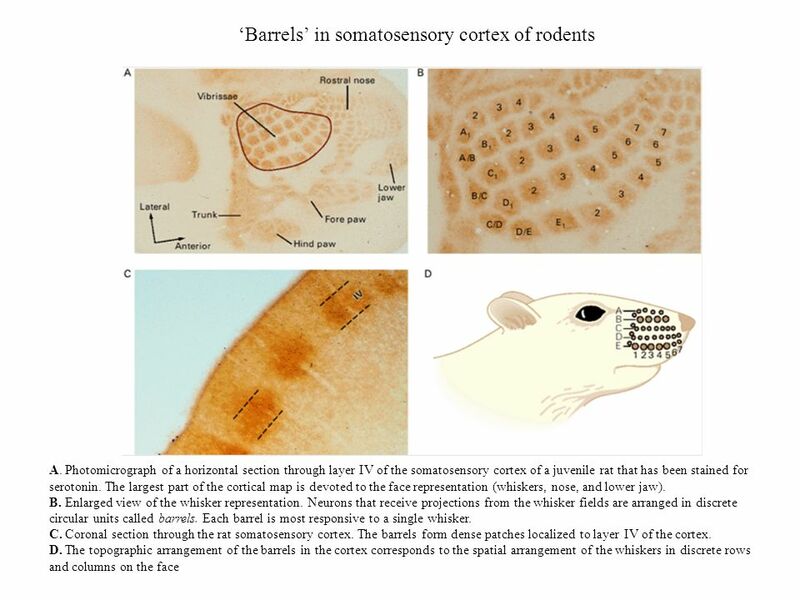 Different species rely on different parts of the body for adaptive somatosensory information. 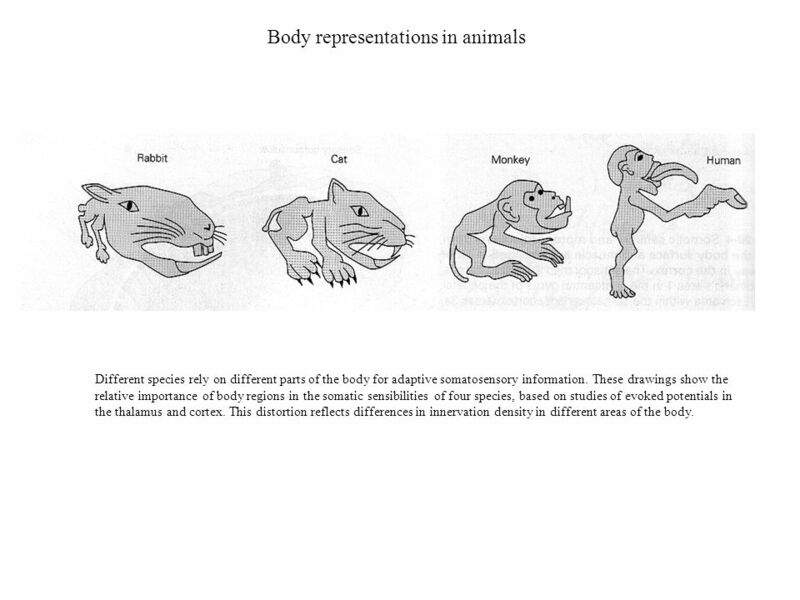 These drawings show the relative importance of body regions in the somatic sensibilities of four species, based on studies of evoked potentials in the thalamus and cortex. This distortion reflects differences in innervation density in different areas of the body. 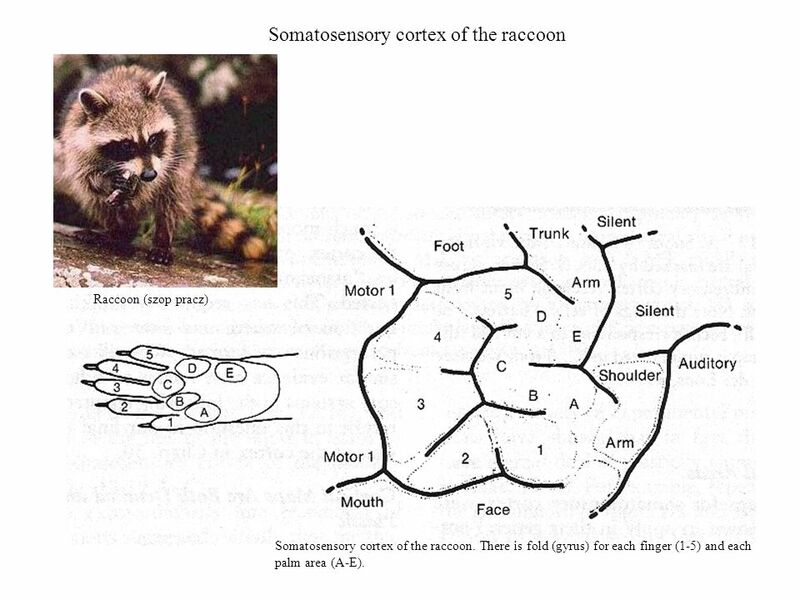 Raccoon (szop pracz) Somatosensory cortex of the raccoon. There is fold (gyrus) for each finger (1-5) and each palm area (A-E). 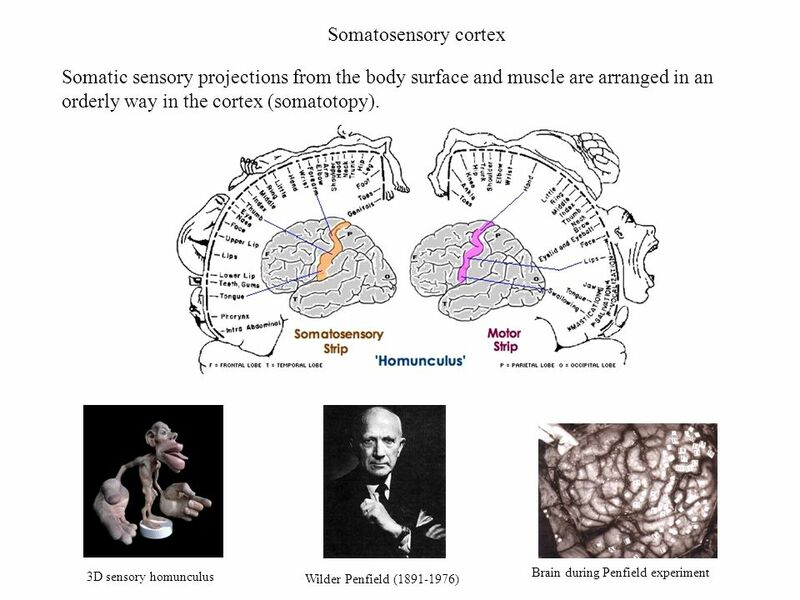 The somatic sensory cortex has three major divisions: the primary and secondary somatosensory cortices and the posterior parietal cortex. A, B. 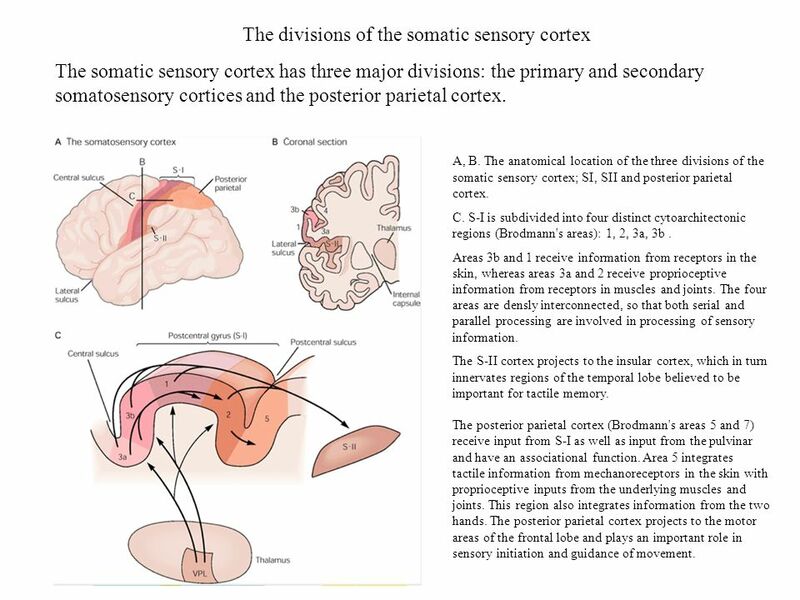 The anatomical location of the three divisions of the somatic sensory cortex; SI, SII and posterior parietal cortex. C. S-I is subdivided into four distinct cytoarchitectonic regions (Brodmann's areas): 1, 2, 3a, 3b . 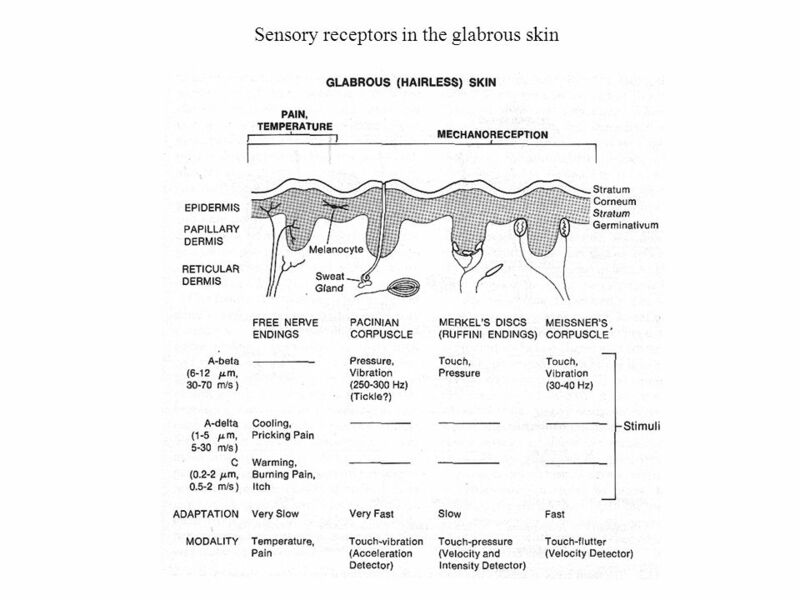 Areas 3b and 1 receive information from receptors in the skin, whereas areas 3a and 2 receive proprioceptive information from receptors in muscles and joints. 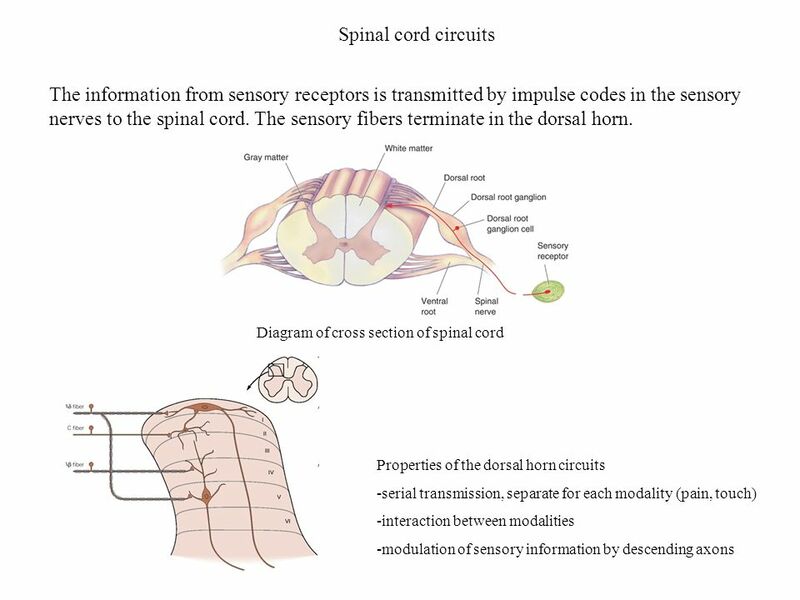 The four areas are densly interconnected, so that both serial and parallel processing are involved in processing of sensory information. The S-II cortex projects to the insular cortex, which in turn innervates regions of the temporal lobe believed to be important for tactile memory. The posterior parietal cortex (Brodmann's areas 5 and 7) receive input from S-I as well as input from the pulvinar and have an associational function. Area 5 integrates tactile information from mechanoreceptors in the skin with proprioceptive inputs from the underlying muscles and joints. This region also integrates information from the two hands. The posterior parietal cortex projects to the motor areas of the frontal lobe and plays an important role in sensory initiation and guidance of movement. 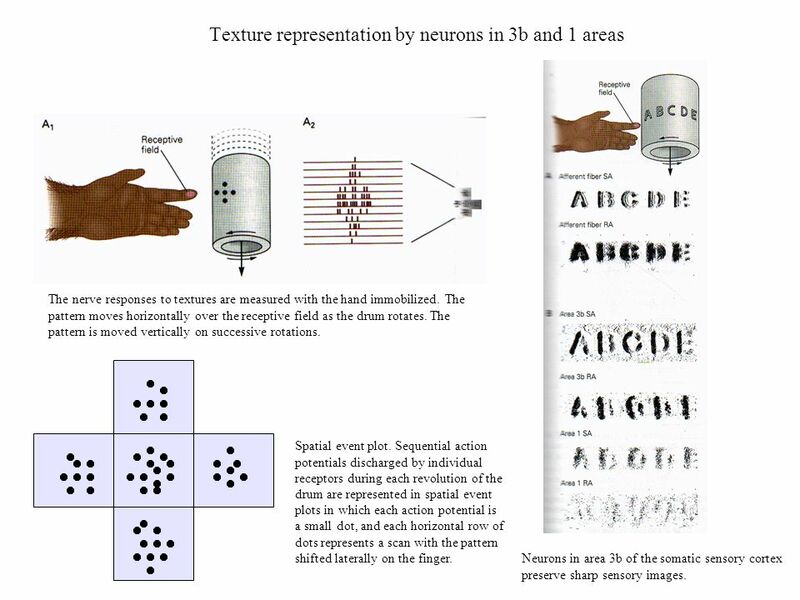 The nerve responses to textures are measured with the hand immobilized. The pattern moves horizontally over the receptive field as the drum rotates. The pattern is moved vertically on successive rotations. Spatial event plot. Sequential action potentials discharged by individual receptors during each revolution of the drum are represented in spatial event plots in which each action potential is a small dot, and each horizontal row of dots represents a scan with the pattern shifted laterally on the finger. Neurons in area 3b of the somatic sensory cortex preserve sharp sensory images. Experiments demonstrating the detailed representation of the digits of the monkey and the plasticity of this representation after different procedures. 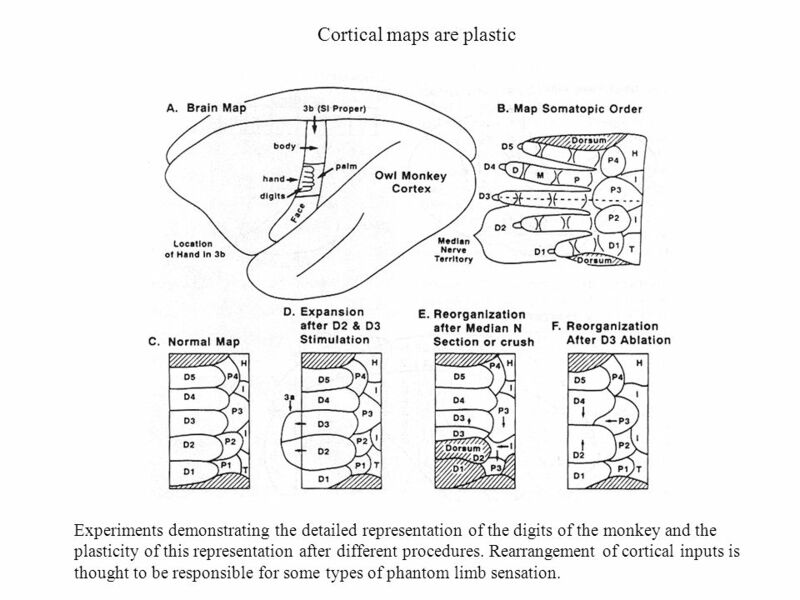 Rearrangement of cortical inputs is thought to be responsible for some types of phantom limb sensation. 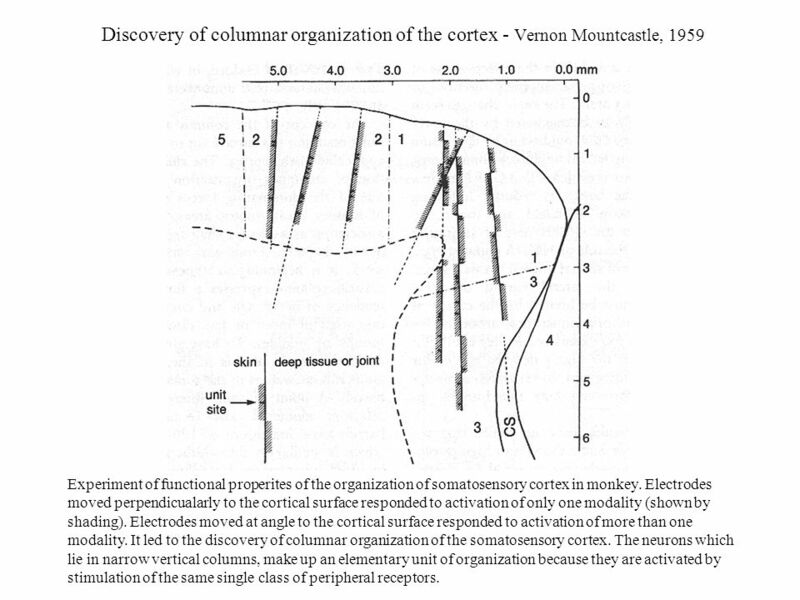 Experiment of functional properites of the organization of somatosensory cortex in monkey. Electrodes moved perpendicualarly to the cortical surface responded to activation of only one modality (shown by shading). Electrodes moved at angle to the cortical surface responded to activation of more than one modality. It led to the discovery of columnar organization of the somatosensory cortex. The neurons which lie in narrow vertical columns, make up an elementary unit of organization because they are activated by stimulation of the same single class of peripheral receptors. 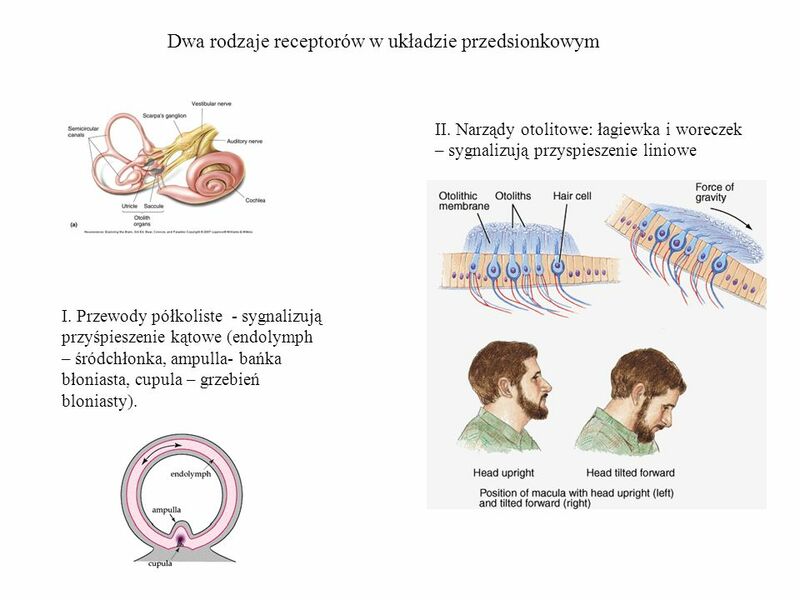 Proprioception – all sensory inputs from the musculoskeletal system : muscle receptorsreceptory w mięśniach joint receptors tendons receptors Kinesthesia – sense of the position and movement of the limbs and sensation of effort, force and weight. It involves: -skin receptors -proprioreceptors -brain signals (e.g. 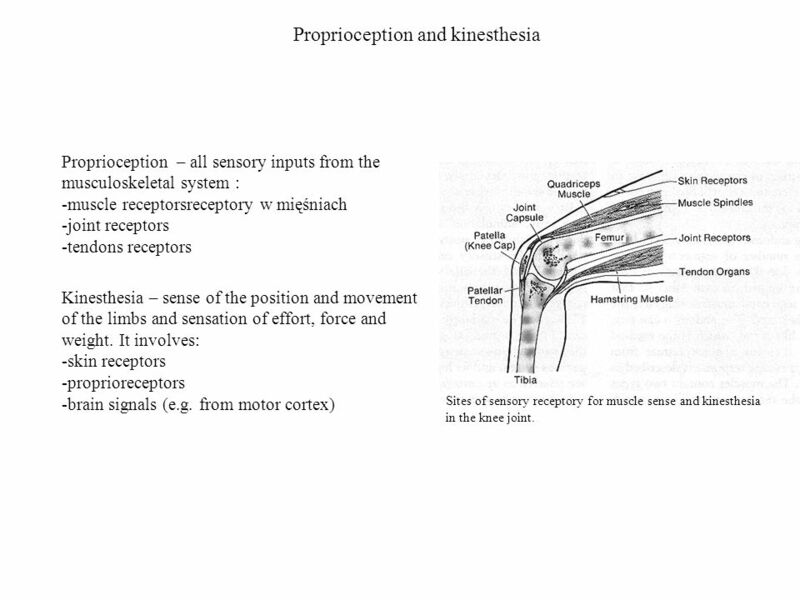 from motor cortex) Sites of sensory receptory for muscle sense and kinesthesia in the knee joint. There are no sensory nerve endings in the muscle of the fish. In amphibians muscle spindles appear in legs. 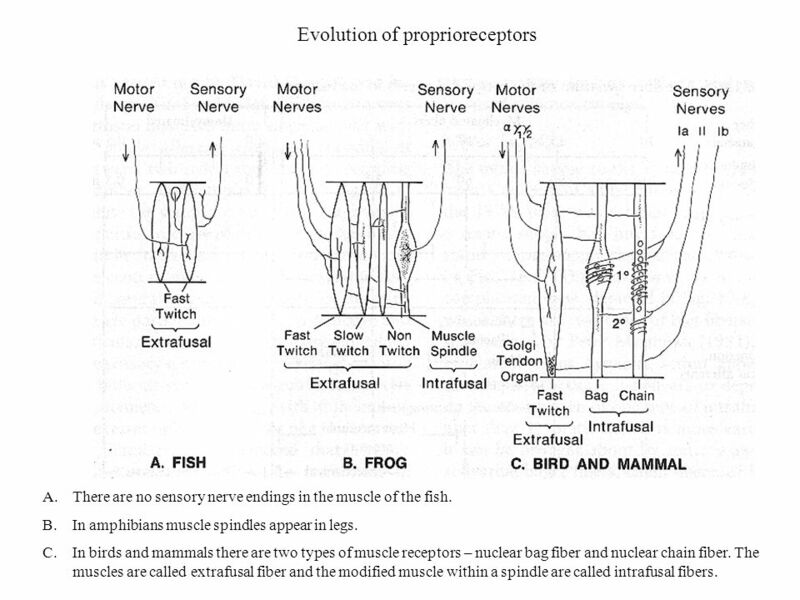 In birds and mammals there are two types of muscle receptors – nuclear bag fiber and nuclear chain fiber. The muscles are called extrafusal fiber and the modified muscle within a spindle are called intrafusal fibers. 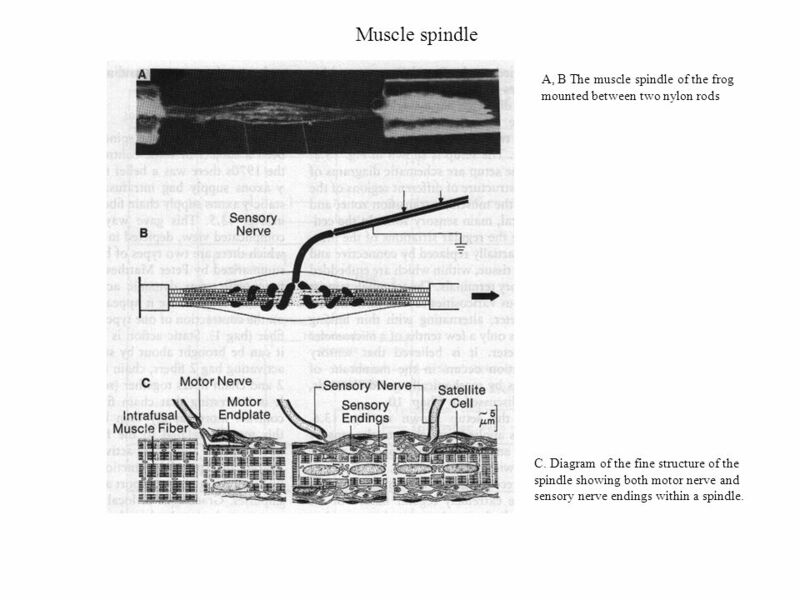 28 Muscle spindle A, B The muscle spindle of the frog mounted between two nylon rods C. Diagram of the fine structure of the spindle showing both motor nerve and sensory nerve endings within a spindle. Responses to different rates of extension. Receptor potential recorded from sensory nerve after blocking of the impulses. Firing frequencies at the dynamic peak and the static plateau of the reponse. 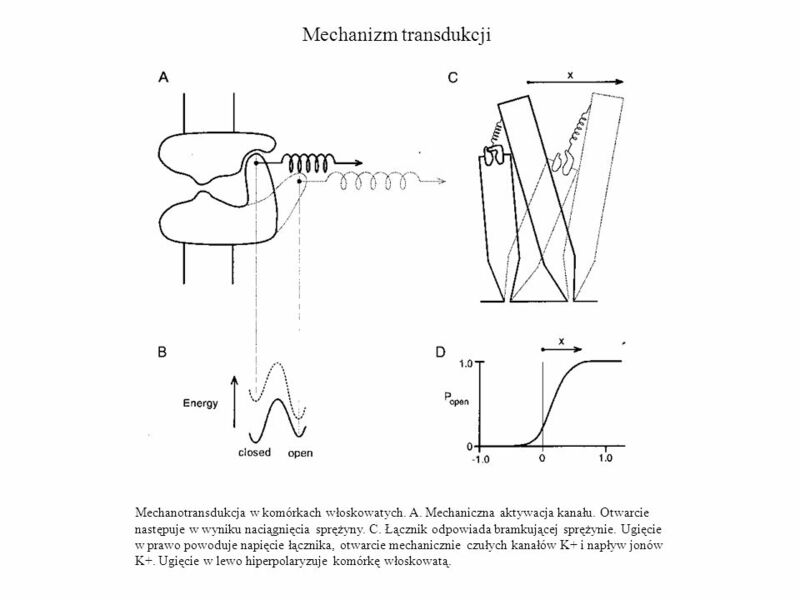 Amplitude of the receptor potential for the dynamic and static phase of the stetch. The results show the ability of the spindle to signal the rate of change and the steady amplitude of the applied stretch with high precision. The muscle spindle contains three types of intrafusal fibers: dynamic nuclear bag, static nuclear bag, and nuclear chain fibers. A single Ia sensory fiber innervates all three types of fibers, forming a primary sensory ending. 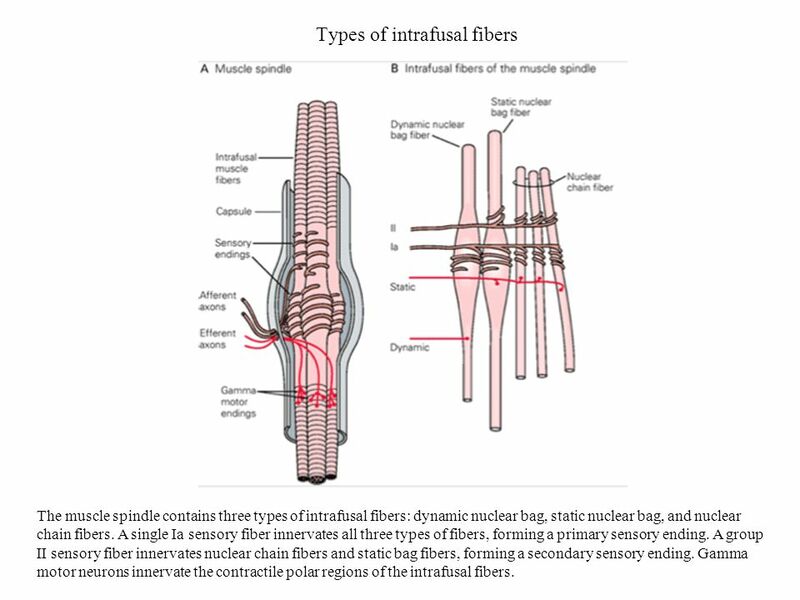 A group II sensory fiber innervates nuclear chain fibers and static bag fibers, forming a secondary sensory ending. Gamma motor neurons innervate the contractile polar regions of the intrafusal fibers. Sustained tension elicits steady firing in the Ia sensory fiber. A characteristic pause occurs in the ongoing discharge of the Ia fiber when the alpha motor neuron alone is stimulated. 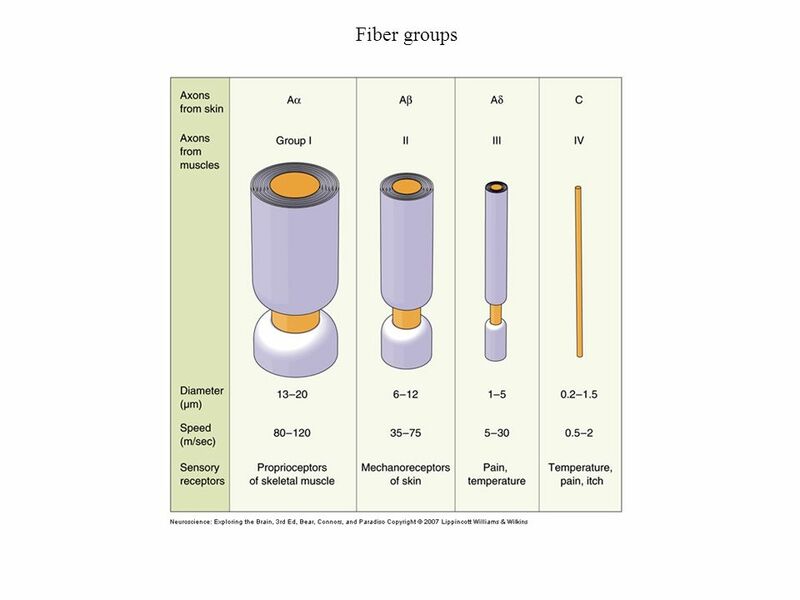 The Ia fiber stops firing because the spindle is unloaded by the resulting contraction. 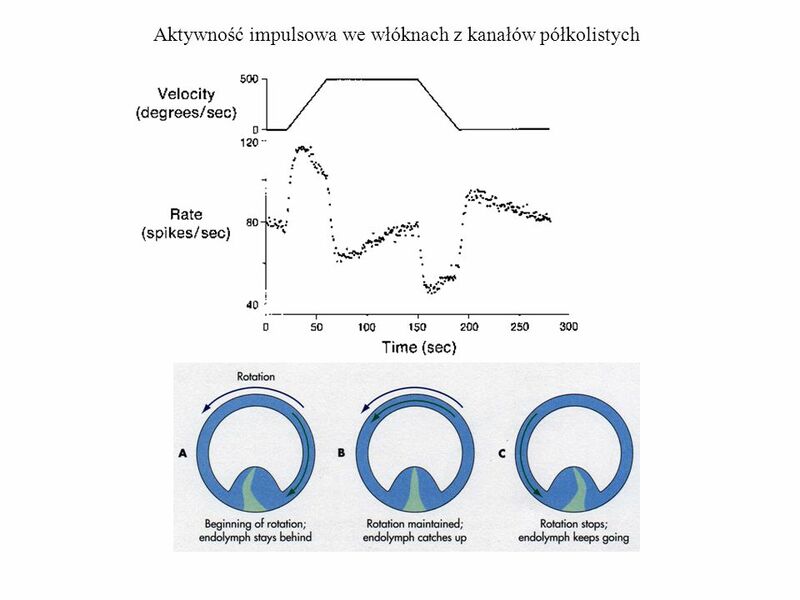 If a gamma motor neuron to the spindle is also stimulated, the spindle is not unloaded during the contraction and the pause in discharge of the Ia fiber is filled in. 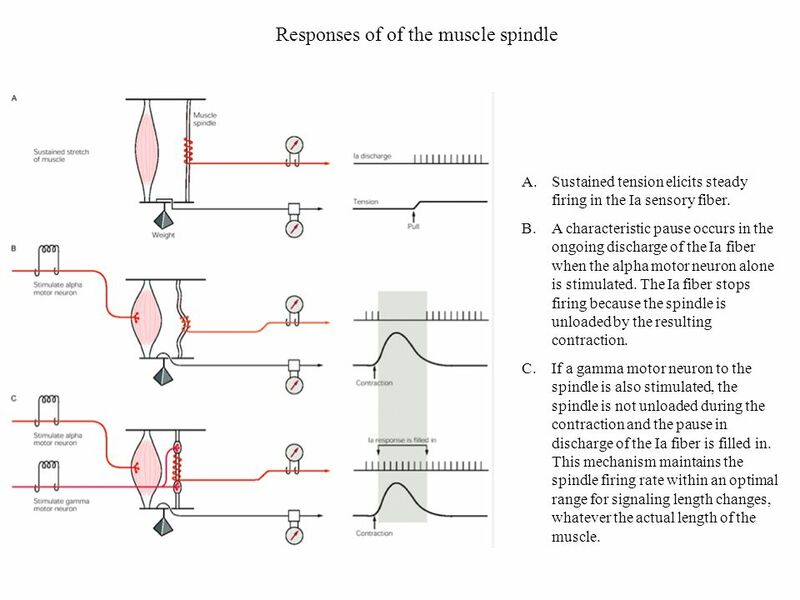 This mechanism maintains the spindle firing rate within an optimal range for signaling length changes, whatever the actual length of the muscle. 32 Golgi Tendon Organs Golgi tendon organs are sensory receptors located at the junction between muscle fibers and tendon. Each tendon organ is innervated by a single (group Ib) axon that loses its myelination after it enters the capsule and branches into many fine endings. 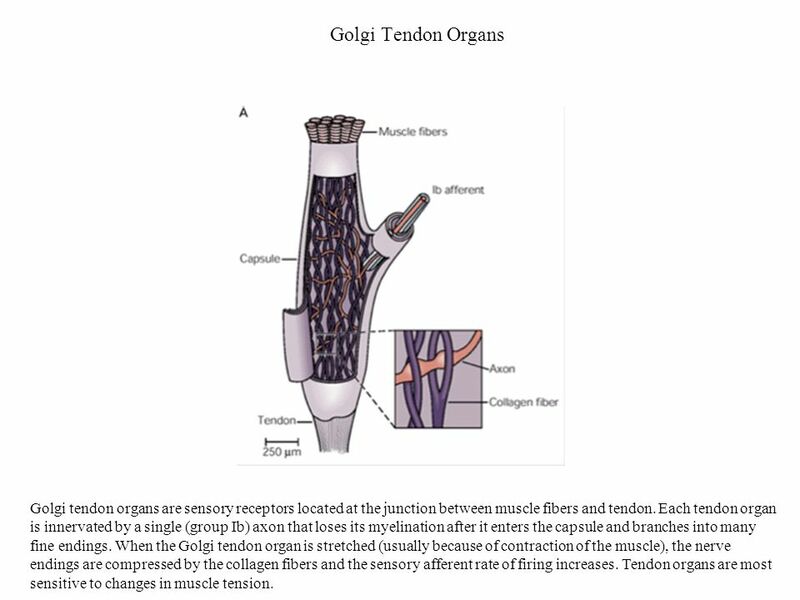 When the Golgi tendon organ is stretched (usually because of contraction of the muscle), the nerve endings are compressed by the collagen fibers and the sensory afferent rate of firing increases. 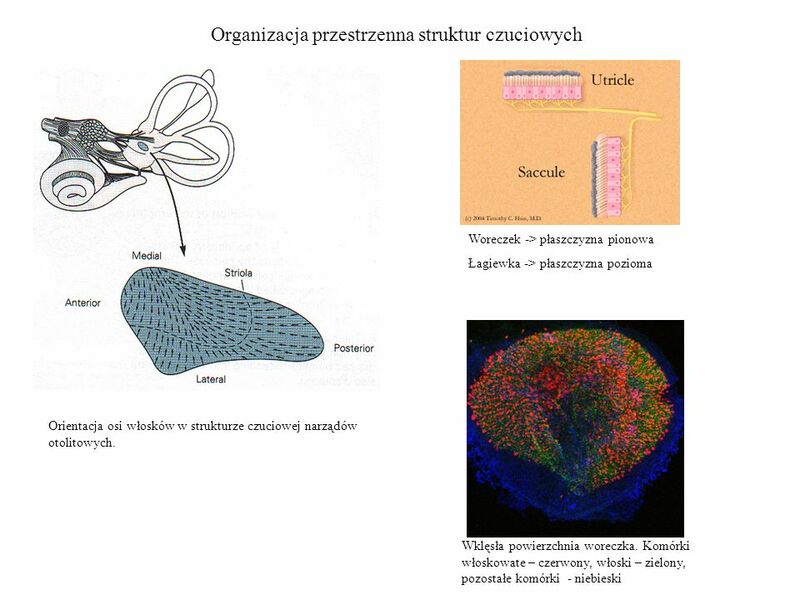 Tendon organs are most sensitive to changes in muscle tension. 33 Joint receptors Sensory receptors innervating the knee joint. Type I receptors resemble Ruffini endings of the skin. 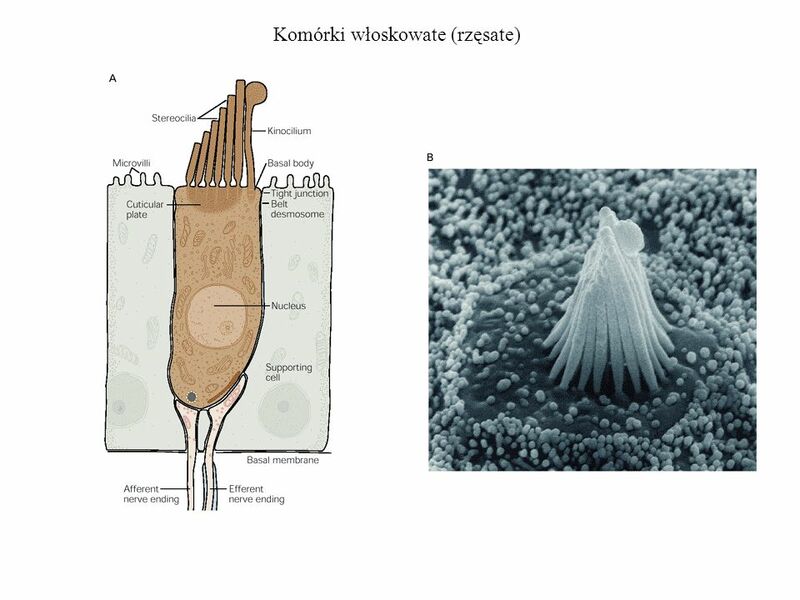 Type II receptors have the form of flattened Pacinian corpuscle. Type III resemble Golgi tendon organs. Type IV are free nerve endings resembling pain fiber terminals. B. Responses of the joint receptor nerves for differnt joint positions in the cat. They cover only extremes of the range of joint positions. 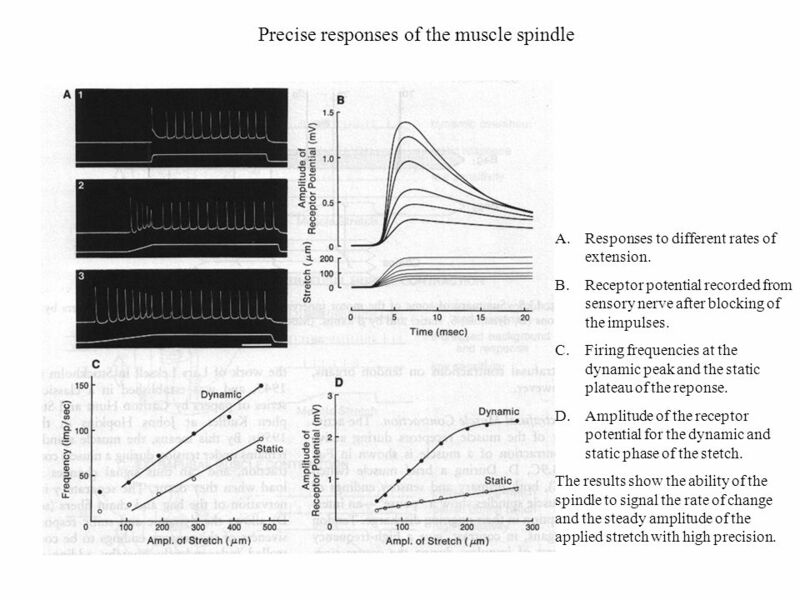 Dashed lines show recordings from primary endings o muscle spindle in muscles around the joint. They contribute to sensation of joint position. II. Narządy otolitowe: łagiewka i woreczek – sygnalizują przyspieszenie liniowe I. Przewody półkoliste - sygnalizują przyśpieszenie kątowe (endolymph – śródchłonka, ampulla- bańka błoniasta, cupula – grzebień bloniasty). 39 Rzęski i łączniki Rzęski komórek włoskowatych tworzą pęczek na szczycie komórki. Długość rzęsek nie jest jednakowa i zmienia się stopniowo. Na zdjęciu po prawej stronie widoczne są włókna (tip link) łączące końce sąsiednich rzęsek. 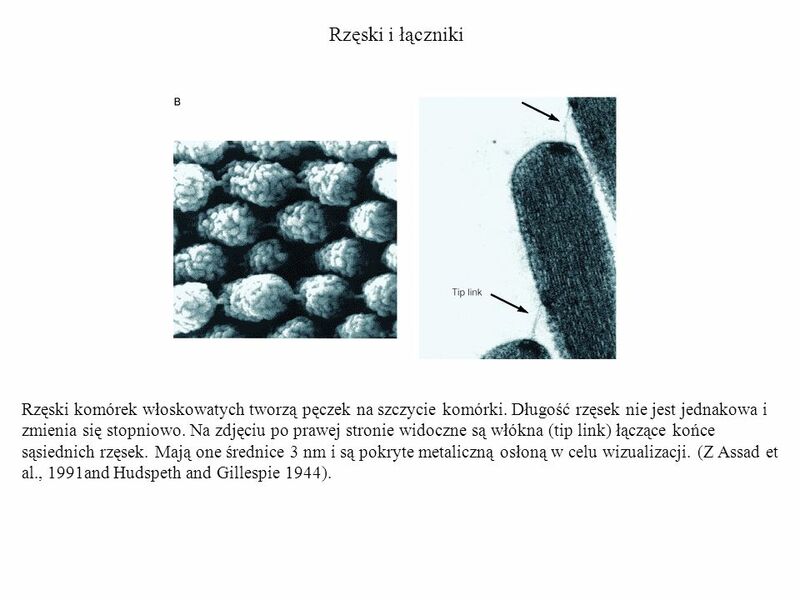 Mają one średnice 3 nm i są pokryte metaliczną osłoną w celu wizualizacji. (Z Assad et al., 1991and Hudspeth and Gillespie 1944). 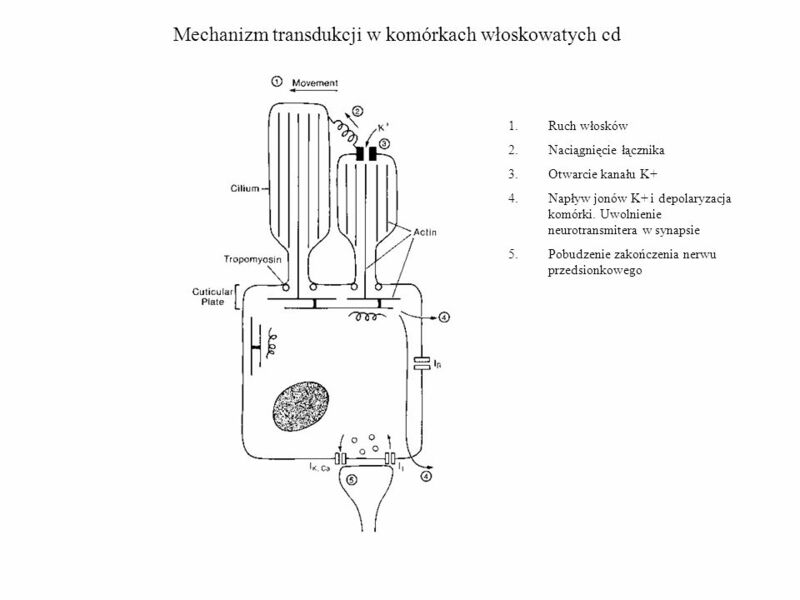 Kanały jonowe biorące udział w mechanoelektrycznej transdukcji w komórkach włoskowatych są bramkowane elastycznymi włóknami łączącymi. Otwieranie i zamykanie kanałów kontrolowane jest przez napięcie włókna, zależne od wychylenia pęczku rzęsek. Gdy pęczek rzęsek jest w spoczynku kanały przechodzą pomiędzy stanem otwartym i zamkniętym, spędzając większość czasu w stanie zamkniętym. Odchylenie pęczka w kierunku dodatnim zwiększa napięcie elastycznego włókna łączącego i prowadzi do otwarcia kanału i depolaryzcji komórki. 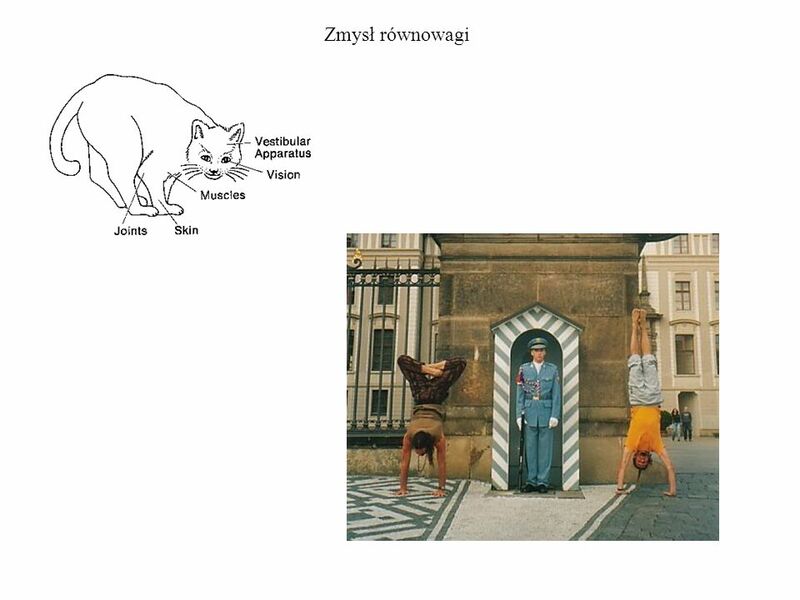 Potencjał receptorowy zależy od kierunku wychylenia pęczka. Wychylenie w kierunku najdłuższej rzęski powoduje depolaryzacje i zwiększa częstość odpalania we włóknie wychodzącym. Wychylenie w kierunku przeciwnym powoduje hiperpolaryzacje i zmniejsza ilość wychodzących impulsów. 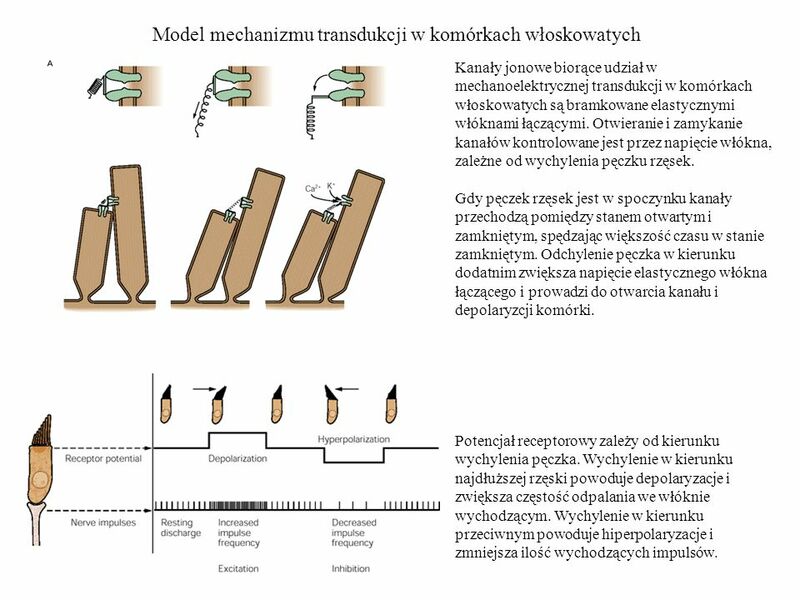 Mechanotransdukcja w komórkach włoskowatych. A. Mechaniczna aktywacja kanału. Otwarcie następuje w wyniku naciągnięcia sprężyny. C. Łącznik odpowiada bramkującej sprężynie. Ugięcie w prawo powoduje napięcie łącznika, otwarcie mechanicznie czułych kanałów K+ i napływ jonów K+. Ugięcie w lewo hiperpolaryzuje komórkę włoskowatą. A. Zanikająca odpowiedź dla stałego pobudzenia. B. Krzywa aktywacji przesuwa się podczas adaptacji, tak by akomodować przesunięcie włosków. C. Zmiany napiecia licznika sa zwiazane z ruchomym punktu zawieszenia. 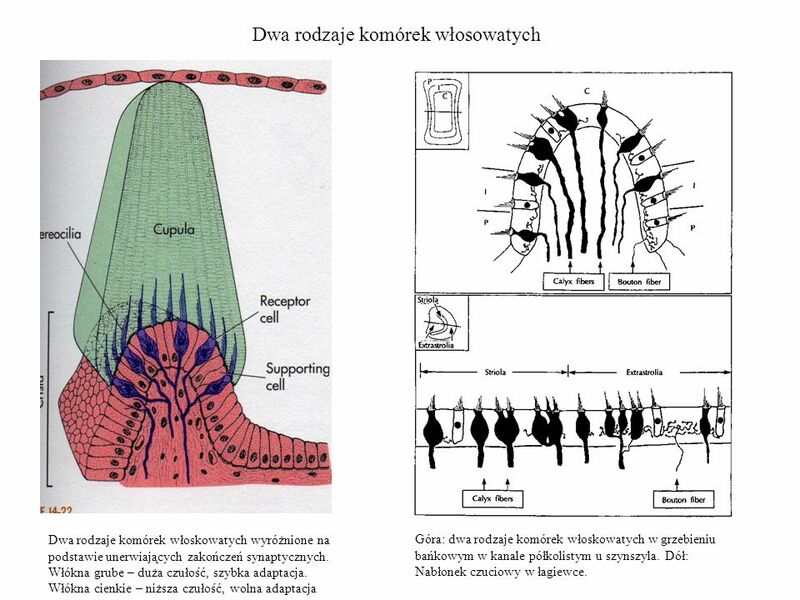 Dwa rodzaje komórek włoskowatych wyróżnione na podstawie unerwiających zakończeń synaptycznych. Włókna grube – duża czułość, szybka adaptacja. Włókna cienkie – niższa czułość, wolna adaptacja Góra: dwa rodzaje komórek włoskowatych w grzebieniu bańkowym w kanale półkolistym u szynszyla. Dół: Nabłonek czuciowy w łagiewce. 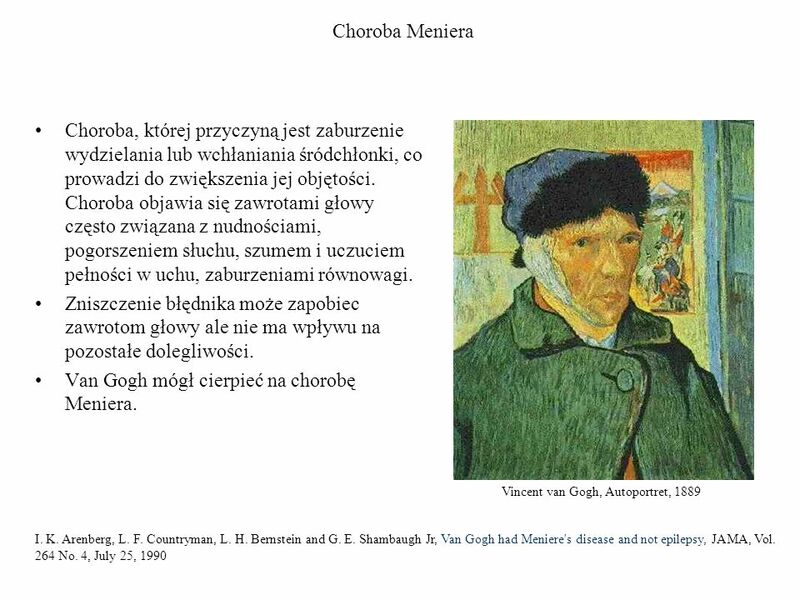 48 Van Gogh mógł cierpieć na chorobę Meniera. 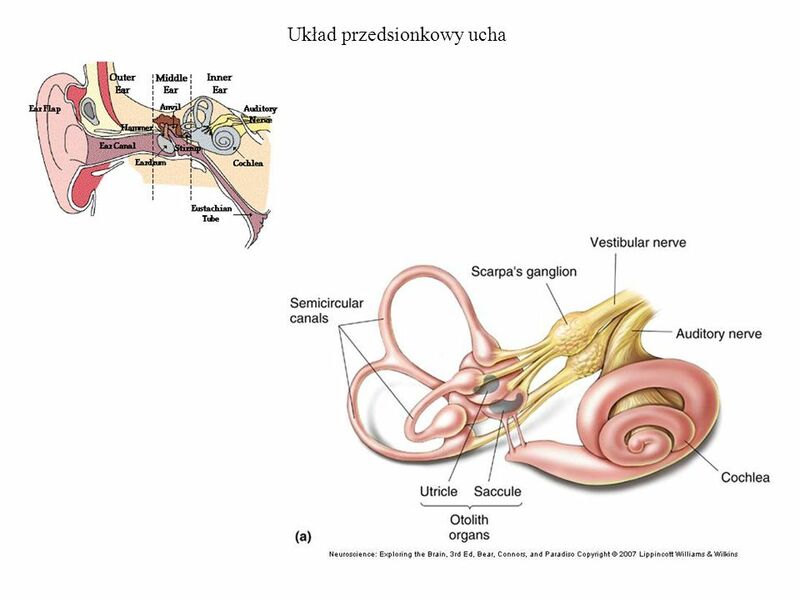 Pobierz ppt "The somatic senses The Greek word for body is soma and the sensory modalities that are signaled by the receptors at the body surface are referred to as."